Engineer new solutions, not new program structures. 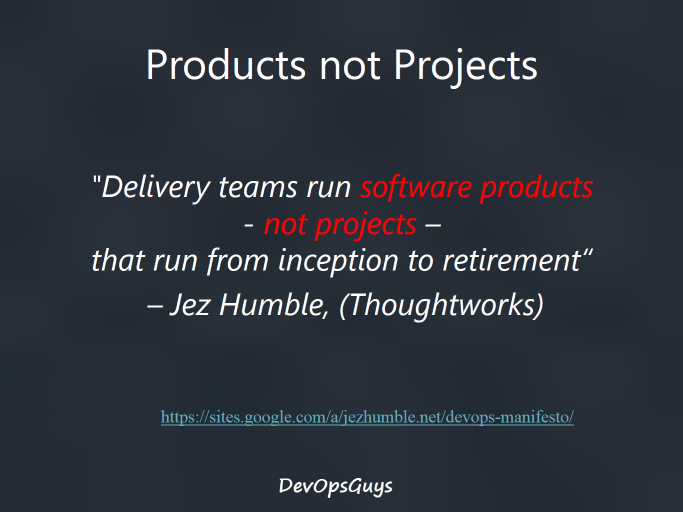 When doing the research for our BrightTalk Webinar on DevOps I came across this quote from Jez Humble on “products not projects”, which really struck a chord with our thinking about what we call the “product-centric” approach to DevOps. One of the key elements of DevOps is to ensure that IT strategy is directly linked with Business strategy. One of the critical scenes in “The Phoenix Project” is where our hero Bill gets to meet with the CFO and they work through the list of “pet IT projects” in the organisation and find that many of them can’t really be tied back to any business strategy or organisational goal. This is, we feel, one of the major problems with the “project-centric” view of IT and why we need to push for a “product-centric” view.